This 311 acre recreational ranch consisting of amazingly tall timberland is the most Beautiful place stocked with tons of Big Game anywhere in southern Choctaw County, OK- and the owner has many pictures to prove it. 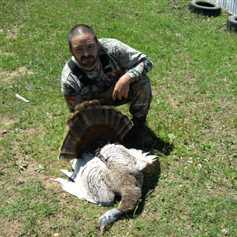 The owner does not hunt, but instead feeds wildlife and enjoys his wildlife mecca that could become yours. In addition, the property is midway between Paris, TX and Hugo, OK, with very close accessibility to the DFW area. This land is conveniently located on a pretty, county maintained road just north of Route 109, and minutes east of 271. If you are looking for the perfect place to possibly build your dream home and be able to harvest record book bucks then look no further. The native mature timberland includes Native pecan, post oaks, red oaks, black jack oak, and hickory plus areas of under-brush for bedding areas. Believe me when I say this is The Best hunting mecca for whitetail deer, wild hogs, and occasional turkey gobblers, as well as small game and varmints. Just imagine all of this just off of the back porch of your new fully electric dream home or cabin just off of the creek. Other activities include ATV trail riding on the many trails throughout the lovely forest, hiking, bird watching, and true enjoyment of nature. With nice, deep water creeks running through the property and strategically placed roads, the game has no reason to leave this tract. In addition, there is a large open area in the middle of the property for a massive food plot to maximize your games full potential with scattered large trees. This is the perfect set up for stand placement around the opening to ambush that wall hanger buck. Schedule a showing of this magnificent mixed use property, call Mike Pate today.